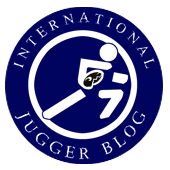 Greetings, international jugger players! It's been a long time since last time we reported from Galicia (northwestern Spain), but here we are again to keep you updated. The Spanish Jugger Community is growing fast and those who already have been in the trenches for more than 2 years have finally established a strong base in our regions, now hoping to stand still while new or stronger jugger teams appear from now on. 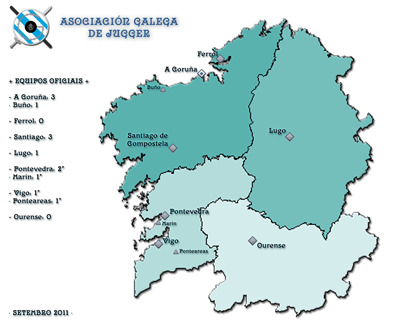 Our group, the “Galician Association of Jugger”, actually operates in the cities of Coruña, Vigo and Santiago de Compostela, housing 8 official and stable teams. Two weeks ago we celebrated the 1st Coruña Open, on February 23, 2013, at the northern city of A Coruña. We were honored to have among us two teams from Madrid and other one from Valencia, besides other galician teams from both Coruña and Vigo. It was the first true experience with other Spanish Juggers, quite small tournament but really distracted and instructive one. We are lucky to have got along with our fellow players, even some of us made new friends or strengthened bonds! 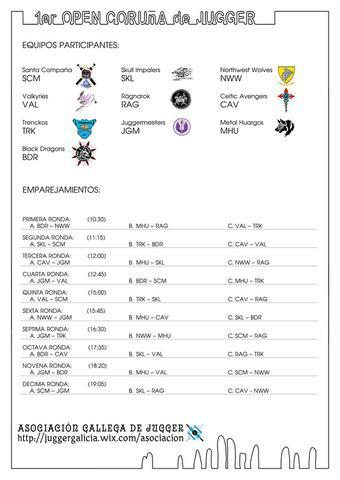 Everyone is willing to meet again, hopefully during the 2nd International Tournament (Zaragoza) on April. While we Galician players are already looking for other Spanish Tournaments to travel to Madrid or Valencia in the next months, we're already organising a Jugger Summer Camp on our shores where we'll welcome any spanish, european or worldwide player! (Full information will be provided in the next months). Here I bring you a small gallery compilation from this tournament, enclosed by some pictures. You can watch full albums on our Facebook Group or visiting our Official Website (v 2.0). 1st Coruña Open (Madrid Camera) Album. Click here! These were the 10 participating Jugger Teams and Final Ranking after 30 classification matches, semifinal and final match. 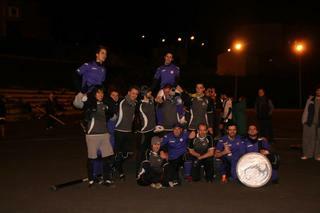 Juggermeisters [JGM] and Metal Huargos [MHU], both from Madrid, Gold and Silver medal respectively. Nice game! Greater fellows. Thank you very much for your attention. Maybe we shall meet in Spain, Germany or somewhere else in Europe. Best regards. Founder of the Galician Association of Jugger. 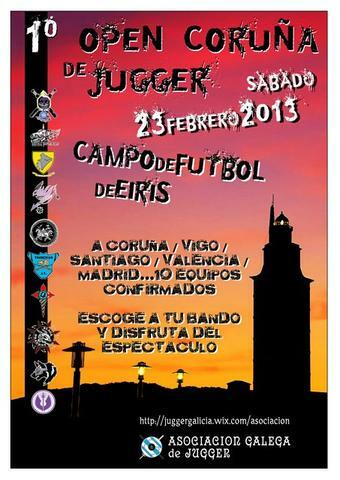 I am pleased to announce the “Galician Association of Jugger”, born in December of 2010 in the city of “A Coruña”, Galicia (northwestern Spain). As many other associations, communities or groups about jugger, we seek to play and expand this awesome sport around our homeland, hoping one day we can reach a high level of players and teams to make several tournaments, leagues and other competitions and activities. 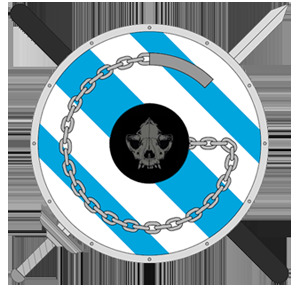 Along with our jugger partners in Spain, we also wish to see the birth of a "Spanish Federation of Jugger", (actually been cradled for a, maybe, near future). It’s been a hard path since December 2010 (especially if everyone knows nothing about jugger) but at last we succeeded. 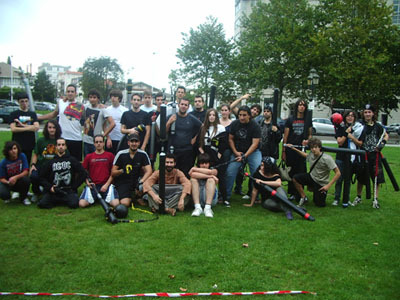 In May 2011 we were celebrating a historical point of our association: after participating in an exhibition called “ExpOtaku” we reached near 150 different players in just 9 hours of jugger sessions (near 210 players altogether). From this moment, teams became to appear and others began to be founded. Nowadays we have lots of people interested but few teams really active and compromised with our organization (near 8); some others are still waiting to have more time and more teams near their cities and towns. This is the next big point we want and also need to improve. Visiting our website and forum you may find everything about us; you can watch some videos and pictures and read about our activities, events, tools tutorials, rules and teams as well. Feel free to contact us in jugger.galicia@gmail.com (preferably in English; we also have one German speaker); I will be happy to assist you answering all your questions or even speak about future meetings and events among our beloved Europe. Hope to meet you all in the “battlefield” someday. Best wishes from Galicia! “Abur” / “Auf Wiedersehen” . Here is a nice clip from the Jugger tournament in Valencia. Skatmen vs. Spuggers. Looks impressive! Keep it going!